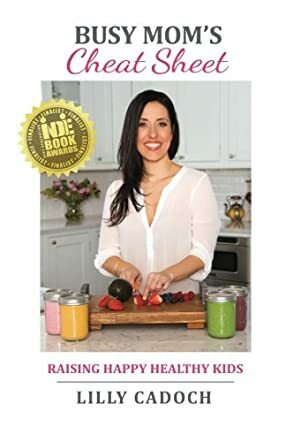 Lilly Cadoch, award-winning author of the book Busy Mom’s Cheat Sheet, is a certified Integrative Nutrition health coach living and working in New York with her husband Eli, her two boys Natanel and Itai, and her dog, Angel. She has spent the last few years learning about nutrition and mindful living for both herself and her family while working full time. Being a very busy working mom in NYC, she was determined to find a way to feed her kids healthy and teach them the tools to have a healthy body and mindset so that they could successfully face the ever growing expectations kids face today. She learned these lessons the hard way over many years and vowed to change that when she had her children. After witnessing first-hand the tremendous results this has had in her family, she wrote this book to share these lessons with all caregivers and their children. This award-winning book is a quick guide aimed at simplifying a lot of information into a very accessible and easy to understand way. Busy Mom's Cheat Sheet by Lilly Cadoch is an uplifting book for readers where the author speaks about the goals of parents and how children are expected to perform well right from a very young age. The book addresses the importance of mind, body and spirit, and how balancing them will help us achieve enriching and fulfilling lives. It also tells how to address the problems revolving around the body, mind and soul separately, helping readers to look into their lives and make the necessary changes; thereby discovering the purpose of their lives. The author handles the topic of body, mind and soul extensively in a manner that can be comprehended by any reader. The balance and harmony that can be achieved after reading this book will bring about the theory of abundance without being wasteful or excessive. The 45 bonus recipes are a treat, simple and easy to try out, helping balance food habits and healthy eating. The positive affirmations shared by the author are motivational and encouraging and will help in making positive changes in one's outlook towards oneself and life in general. I found the tips, techniques and ideas in the book easy to incorporate into daily living. The method of teaching meditation to kids is simple and easy, and the book is a good tool for readers to guide their kids onto a good and holistic path which will be always be beneficial to them. 5.0 out of 5 stars EXCELLENT BOOK - HIGHLY RECOMMEND! Lilly has managed to put everything into a book that you need to know to raise healthy kids! She does not only teach about nutritious foods, her approach is holistic - how to raise a child in today's world, nourishing them on every level; body, mind and soul. From incorporating activity after a day of sitting in school to meditating and saying prayers as part of the bedtime routine, you and your children will benefit from her sound advice. 5.0 out of 5 stars... a busy dad I felt this book might be useful.. Although I am a busy dad I felt this book might be useful... I was correct! This book is jam packed with so many helpful tips that will make any busy parent life easier and will allow you to stop and focus on what is really important which is our kids! 5.0 out of 5 stars Must read for busy moms!! As a busy mom on the go with a toddler and a 9 year-old I found this book to be a great guide to help me keep my kids mindful and healthy! The breakdown of ingredients was very helpful for me especially since I commute an hour each way to work. This info kept the guesswork out of giving my family a healthy dinner, a must read!!! Fabulous book! Lilly Cadoch has put a lot of helpful information into a simple format that even the busiest parents can appreciate. From nutritious meals on the go to effective time management for families, this truly is a "cheat sheet" for parents who want to live a healthier lifestyle. Highly recommended! I love this book! It is a straight forward, sensible and concise roadmap for the needs of your growing children. You will feel nourished in body and mind when you read and then start using the ideas and recipes. There is so much anxiety about raising happy, healthy children--this book will help you relax and enjoy the process. You could probably figure all it out yourself but it would take years of thought and research and here it is in one place for you. Highly recommended. I must say that I thoroughly enjoyed this great book by Lilly Cadoch. Lilly Cadoch has given us a book that will help mothers to raise their children healthy and happy,through food which will help with mind and body.There's so many choices to help busy mothers to keep their children health in check and the options to help teach your children the proper know now that is needed for keeping up the good lifestyle for the rest of their lives. I really think every young parent caregivers and even grandparents need to one click this great book and see what all the talk is about. I highly recommend that you read this amazing book, because you won't be disappointed. The author has made a clear, easy to read, thoughtful book that can help any and every mom (and dad) out there. This book is parent to parent so it's relatable and honest. You are not reading what a "professional" thinks parenting should be like but rather from a real parent running a real life. Highly suggested. As a busy single mom of two kids, I highly recommend this book. I use Lilly's tips daily to make healthy food choices for my family. All you need to know to be knowledgeable about what is in the foods you are eating daily and feeding your family with - with helpful tips of you can make the best food choices when purchasing food and implementing a healthy lifestyle for your children, that they will in turn learn and recognize for themselves. I find myself sharing tips with my mom friends and loves ones frequently since I finished this book. Bravo Lilly job well done! Lilly’s book gave me great practical advice on things such as food selection and living with gratitude. As a working mom of three, it’s not always easy to remember to be grateful. I especially loved the section on positive affirmation that were great conversation starters in my family. 5.0 out of 5 stars Must read for busy moms looking for the CliffsNotes version to raising healthy happy kids! I just finished this book and it's really the most warm, generous, truly helpful book about children's health (mind and body) that I've read. It includes tips for mealtime (lots of easy recipes), bedtime, and time (management) in general! And so much more. The Busy Mom's Cheat Sheet was a pretty interesting read. I have one youngling of my own and it is hard to get her to eat healthy while having a busy lifestyle. There are lots of different choices for helping keep your kids healthy and different options for giving your kids the knowledge they need to know to keep up that lifestyle in their lives. I will admit I am not a big cooker, I'm more of a what can I cook that takes the least amount of time type of mom, but there are some items in here that I would definitely try out with my own kid. I enjoyed reading it and think any parent would benefit from reading it.